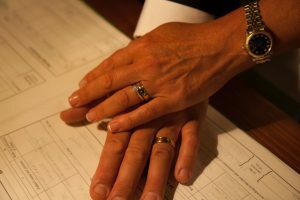 We believe your wedding rings represent a truly personal symbol of love and commitment that is as individual as you. Start your journey together by creating beautifully crafted wedding rings that will last a life time. Bring your fiance’s dream design to life that they will adore forever. The centre piece of your special day is the exchange of rings. We will expertly melt, file and set together your choice of precious metals and gems, for perfection on the big day. we offer the opportunity to take part at the workbench. As an ethical company, we enjoy the recycling of old jewellery. By melting it down and using it in your new piece you retain the sentimental value. View starting from prices here.